Acqua, a celebration of "the power of the sea," is the kind of place you can slip into, sit back with a glass of wine and enjoy some pasta. 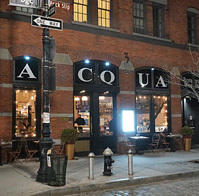 The restaurant is located in the heart of the Seaport District, but doesn't feel touristy. One thing you will notice as you walk through the door, is the catch of the day on ice. It's available steamed or baked. Branzino, Wild Salmon and Whole Lobster are among the staples on the menu. 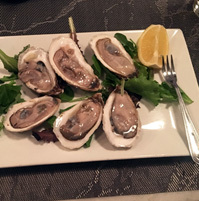 There's also fresh oysters available a la carte or part of the "Chef's Selection" of raw shellfish. Several pasta dishes are offered including lobster with cherry tomatoes or cockles in a garlicky white wine sauce. There's also fettuccine bolognese and lasagna with beef ragu. Pizzas and panini sandwiches are also available, along with larger plates, including a ribey with roasted potatoes and braised organic lamb shank. The space boasts over-sized window, wood floors and a full bar for dining and drinking.